Situated on the boundary of the townlands of Edergole, Cronakerny and Crolack. Name from J. Glover. Croaghbane is the 216th highest place in Ireland. 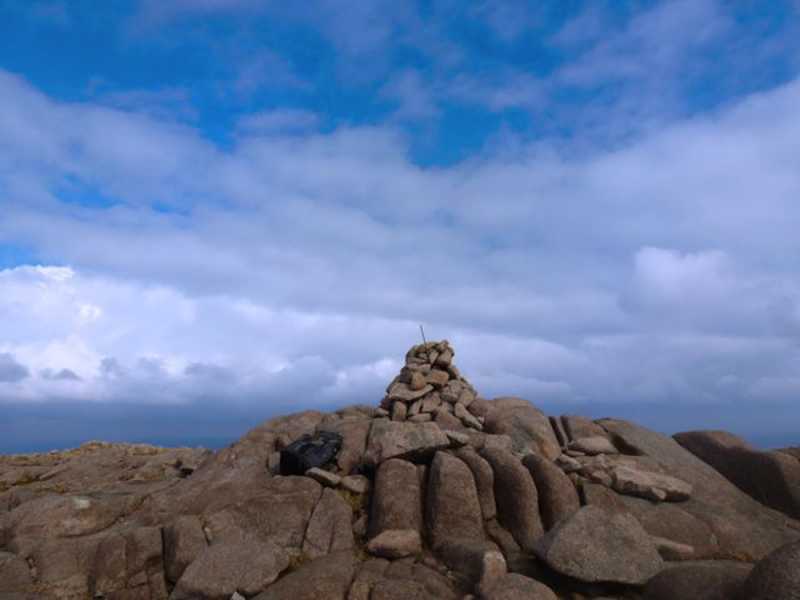 Climbed at the end of April as first mountain in Bluestack 5. Access from Glenties to Ballybofey road, at 967964 B turn off onto narrow road into Reelan Valley, follow for 1.5 miles to an old schoolhouse on right. This is a wild and rugged area with the Bluestacks laid out along the lenght of the valley. Park here and walk back a short distance to take lane downhill towards river and isolated farmhouse almost hidden by conifers. Turn left after crossing the river following waymarked posts. Start climbing after passing a ruined house up the slopes of Glascarns Hill (578m). The ground was very wet here and it was a job to try and pick out a drier route. I came to a new fence which was crossed by heading right to a metal farmgate. 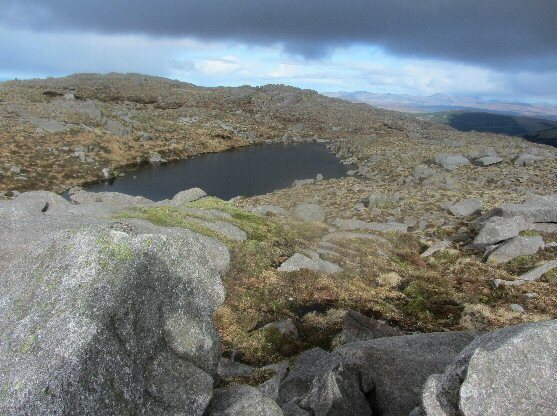 The ground then becomes rockier and levels out traversing an area of pools before climbing again to reach the summit of Glascarns after 1 h 45 mins. 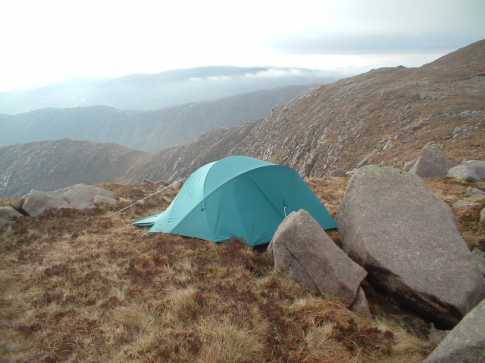 As it was late in the evening i pitched down here for the night (see pic) just above Cronloughan 1000ft below. I had an uncomfortable nights sleep as the temperature fell away (must get a better sleeping bag) but also a great feeling as probably the only person up in the hills. After packing up the next morning it was a short climb up to the summit of Croaghbane, with some great views down into the Owendoo River valley before entering the mist near the summit. Lough Aduff is just before the top and would have been a better spot to camp down. The summit cairn is just off to the west and i could see little in the mist. 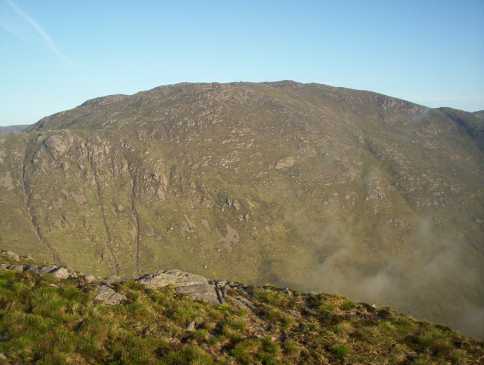 The mountain is nothing special to look at from this side but it is a good climb and there is good views on the way up, especially to the steep eastern side above Cronloughan. I am sure the view from the top on a clear day would be excellent. (See Ardnageer for continuation of the Bluestack 5 circuit). Picture from bryanmccabe : An icy Lough Belshade! Picture: An icy Lough Belshade!